Ideally, you will create a separate folder or module specifically for your welcome and your getting started package. This may also be part of your week one instructions. By setting them in a separate folder or module, students can refer to them throughout the course. A proper welcome to your course helps to generate student enthusiasm for your course. This can be difficult to do with only the written word. As a result, online faculty evaluations tend to have lower ratings for “Instructor showed enthusiasm for course” compared to face-to-face courses. Time should be taken to write your introduction to generate prose that demonstrates your interest in the course you are teaching. You may also consider including a video where you discuss your course. Here is a video I included for a course that I previously taught. As you can see, it is not polished, but they do get to get to know me a little more. In this article, the author points out research pointing out instructors who included welcome videos had better participation, higher course evaluations, appeared to be a more effective teacher, and better connection with students. In Raymond Wlodkowski’s book, Enhancing Adult Motivation to Learn: A Comprehensive Guide for Teaching All Adults, he offers 11 strategies for establishing inclusion among adult learners. These strategies are applicable for all types of classrooms. Provide an opportunity for multidimensional sharing. Concretely indicate your cooperative intentions to help adults learn. Share something of value with your adult learners. Use collaborative and cooperative learning. Clearly identify the learning objectives and goals for instruction. Emphasize the human purpose of what is being learned and its relationship to the learners’ personal lives and current situations. Assess learners’ current expectations, needs, goals, and previous experience as it relates to your course or training. Explicitly introduce important norms and participation guidelines. When issuing mandatory assignments or training requirements, give your rationale for them. I have bolded strategies that should be considered for your introduction and welcome. As part of your online course, you should provide a walk through your course explaining where things are located and how to properly participate in the different assignments. This increases learner comfort and they can then focus on the task of learning rather than be distracted about how the course works. Here is an example of an overview I gave using one of my Moodle courses and a secondary software program we were using. Here is also a screencast of a secondary Website I was using to support a class. This is a walkthrough of the software. They are very easy to create and they quickly help students understand how to use a program. 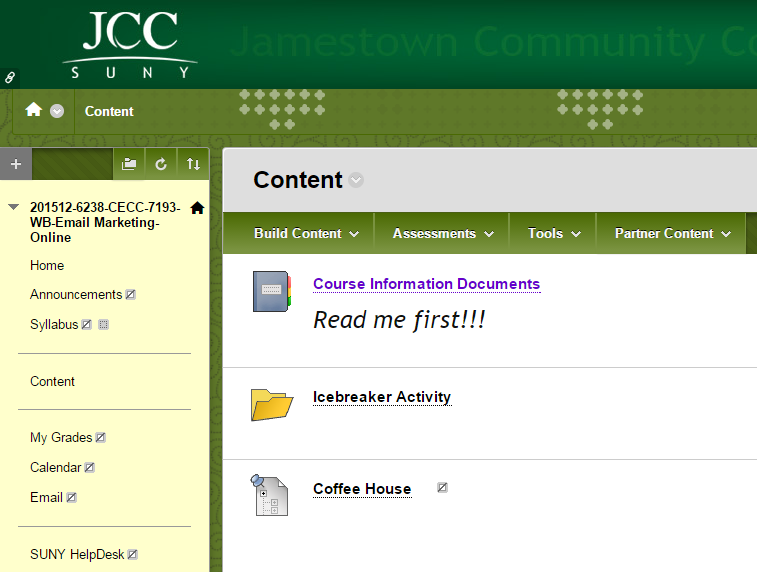 As part of JCC Blackboard, new courses begin with a template that includes a getting started package (folder). We call it “Course Information Documents” and it is found within the contents folder. This provides you with a jump start on preparing your course. My Expectations – What do I expect from you in the course? You can use and modify all of them, or choose to delete them. The more information you can provide and have available, the better the learners will be able to perform. This first OSCQR item focuses on setting the stage for a great course. Beginning with an enthusiastic welcome and a robust getting started package will put students on the right path to success. Video has demonstrated to be a strong element for increasing participation and connection and should be used whenever possible. Take time to prepare a strong welcome. If you have questions, please stop by and visit the TEI Team. Here are some additional articles focusing on the importance of a welcome section as well as the importance of videos to your online courses. Why do Learners Drop Out of a Course? Are you including everyone in your instruction? How do you weave motivational strategies into your instructional design? Wlodkowski, R. (2008). Enhancing Adult Motivation to Learn: A Comprehensive Guide for Teaching All Adults (3rd ed.). San Francisco: Jossey-Bass A Wiley Imprint.